Already in 1914 came a larger plan for the correction of Pfinz. The First World War and the financial hardship of the 1920s, the realization had to wait, but ultimately showed the flood in 1931 the need for action. On 16 November 1934, the groundbreaking ceremony was held for Pfinz-Saalbach-correction, for the Reich Labor Service was used. There were plans for the lowering and straightening as well as the construction of a relief sewer. 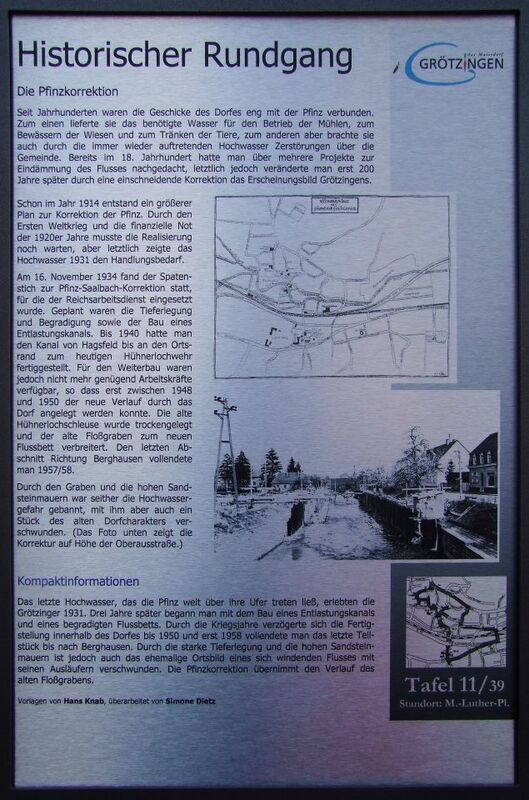 By 1940 they had completed the channel of Hagsfeld up to the outskirts of today's chicken hole defense. However, not enough workers were available for further construction, so that only 1948-1950 of the new course could be created through the village. The old chicken hole lock was drained and widened the old Floßgraben the new riverbed. The last section direction Bergshausen you completed in 1957-58. For centuries the fortunes of the village were closely connected with the Pfinz. First, it provided the water needed for the operation of the mills, for watering of lawns and watering the animals, on the other hand they also brought by the recurring flood damage on the town. Already in the 18th century had been thinking about more projects to curb the flow, but ultimately it until 200 years later altered by a drastic correction of the appearance Grötzingens.